Signing up for Microsoft Translator and getting your credentials. 1. 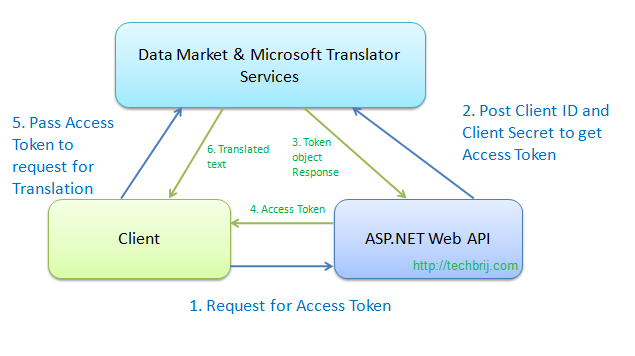 The client requests to asp.net web api for the access token. 2. Web API has “Client ID” and “Client Secret” for the app in the marketplace. So it posts them to obtain the access token. Note: We don’t want to disclose “Client ID” and “Client Secret”, that’s why It’s done on server side. 3. The response for the token request contains the access token. 4. the access token is given to the client. 5. 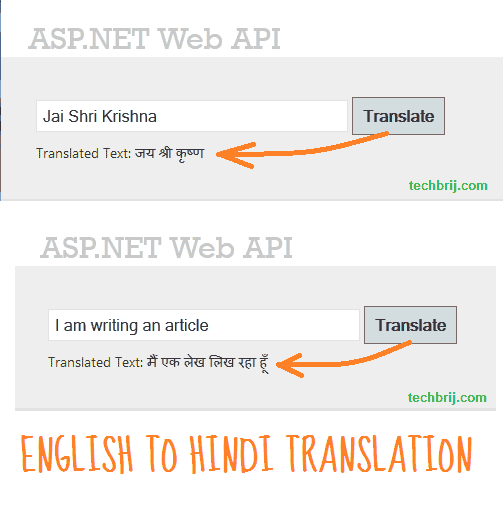 Now client can access Microsoft Translator API with access token and request for translation. 6. The response for translation request is the translated text and client can display the output. // Create form parameters that we will send to data market. ClientID and ClientSecret stored in Web.Config appsettings are passed in HTTP POST request to the token service to obtain the access token. The response is JSON-encoded and includes the access token. UI has Textbox for user input, translate button and span to display output. In above code, when user clicks Translate button, Web API method is called to get access token which is added to a string, prefixed with “Bearer ” (don’t forget the space) and send to the translator service. On translation service response, callback method is called to display the output. We are using “en”(English) to “hi”(Hindi) translation. You can find the other language codes here.